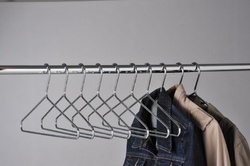 We are specializes in manufacturing and supplying a qualitative range of Metal Hangers. this types hanger shops & any were if required information please contact us. Our organization specializes in manufacturing and supplying a qualitative range of Metal Hangers. These hangers are manufactured using high quality metal at our state-of-the-art manufacturing facility. In our range, we offer wire hangers, folding hangers, wall hangers, display hangers, clip hangers, saree hangers and polished chrome hangers. The products we offer can be availed in different sizes and designs to suit varied requirements of apparel industry and households. 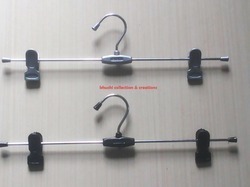 Our organization is engaged in this domain, we are offering an excellent quality Metal Clip Hanger. 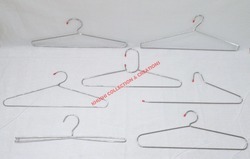 Demanded in garment industry for hanging clothes, offered clip hangers are made by using best grade material in compliance with global quality standards. These clip hangers is offered in numerous sizes for fulfill the varying demands of our customers. Our organization is counted among the most distinguished manufacturers and suppliers of Metal Hangers. Customization of our range is offered by us in order to meet the requirements of varied customers. We offer these metal hangers to the clients at industry-leading prices.